ENSENADA, Baja California, Mexico — Highlighted by an in-depth preview of the season-opening 32nd annual SCORE San Felipe 250 in Baja California, Mexico, Vol. 4, No. 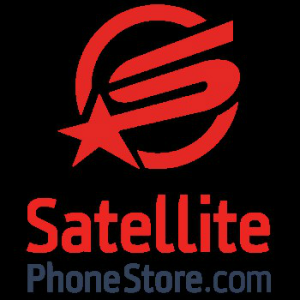 3 of the acclaimed SCORE Journal digital magazine is now online. This issue also includes special feature stories saluting the road to the 50th BFGoodrich Tires SCORE Baja 500 as well as SCORE News on the two new SCORE sponsors. Vol. 4, No. 3 of the SCORE Journal is once again filled with numerous interesting worth-reading features, stories, exciting videos and several news items. 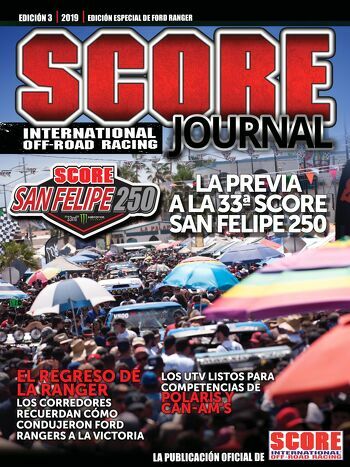 This edition is centered around an extensive look at the season-opening 32nd SCORE San Felipe 250 including the map of the expanded, race-record 319-mile course. 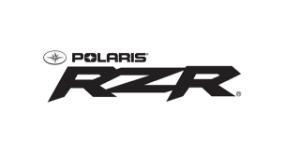 Big SCORE News announces Polaris RZR and VP Racing Fuels joining the SCORE family of “Official Product” partners and Sal Fish and Ivan Stewart being the co-Grand Marshals for the upcoming golden anniversary of the SCORE Baja 500. This issue also has a feature on Bruce Meyers and his Meyer’s Manx that holds an important place in Baja desert racing history. 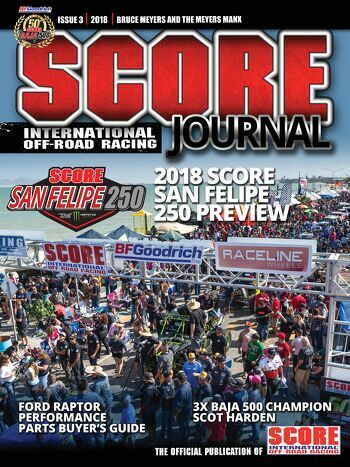 The SCORE Journal begins shining a very bright spotlight on 50 Years of Glory—a celebration of this year’s 50th anniversary BFGoodrich Tires SCORE Baja 500 to be held May 30-June 3 in Ensenada, Mexico. The SCORE Baja 500 was the first race produced by SCORE in Baja California, Mexico on July 26, 1974. The spotlight features looking at the golden anniversary of the SCORE Baja 500 in this issue are unique and colorful stories on SCORE Baja motorcycle racing legends Johhny Campbell and Scot Harden. 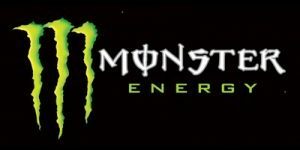 Campbell was the overall motorcycle winner of the SCORE Baja 500 six times and Harden was the overall motorcycle winner of this race three times. The Off-Road Marketplace in this issues shines brightly on the latest off-road products for 2018 for racers and enthusiasts. 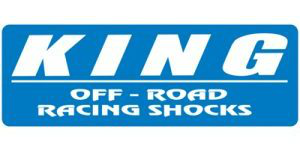 Included are new innovations in air and fluid coupling from RainMaker Inc. as well as new performance parts for the Ford Raptor and the Off-Road Ford F-150.